Polbase - Reference: Crystal structure of the processivity clamp loader gamma (gamma) complex of E. coli DNA polymerase III. Crystal structure of the processivity clamp loader gamma (gamma) complex of E. coli DNA polymerase III. 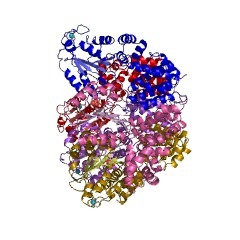 The gamma complex, an AAA+ ATPase, is the bacterial homolog of eukaryotic replication factor C (RFC) that loads the sliding clamp (beta, homologous to PCNA) onto DNA. The 2.7/3.0 A crystal structure of gamma complex reveals a pentameric arrangement of subunits, with stoichiometry delta':gamma(3):delta. The C-terminal domains of the subunits form a circular collar that supports an asymmetric arrangement of the N-terminal ATP binding domains of the gamma motor and the structurally related domains of the delta' stator and the delta wrench. The structure suggests a mechanism by which the gamma complex switches between a closed state, in which the beta-interacting element of delta is hidden by delta', and an open form similar to the crystal structure, in which delta is free to bind to beta.